(CNN) -- Up to 30 million people are facing "a humanitarian disaster" as one of Africa's biggest lakes shrinks, a United Nations agency warned Thursday. 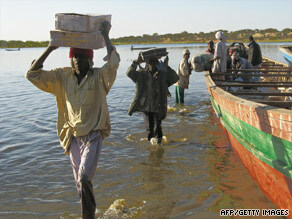 Porters remove goods from a boat on Lake Chad in 2007. Lake Chad was about the size of Maryland -- bigger than Israel or Kuwait -- in 1963, satellite images show. By 2001, it covered less than one-fifth of that area -- making it smaller than Delaware or Mauritius. The drying-up of the shallow lake is fueling conflict and migration, the U.N.'s Food and Agriculture Organization said. Once one of the biggest bodies of water in the world, it could disappear entirely in about 20 years, the FAO said, citing forecasts from the U.S. National Aeronautics and Space Administration. "If that happens it's going to be a disaster," Parviz Koohafkan, director of the Land and Water Division of the FAO, told CNN by phone from Rome. The Lake Chad basin is "one of the most important agriculture heritage sites in the world -- the biodiversity, the migratory birds, not to mention more than 20 million people living out of Lake Chad -- fisherpeople, farmers." "It would be a human disaster, a tragedy," he said. "In this case we have people who are the poorest of the poor." "In addition to an approximately 60 percent decline in fish production, there has been degradation of pasturelands, leading to a shortage of animal feed estimated at 45 percent in certain places in 2006, reduction in livestock and biodiversity," the agency said. The disappearance of the lake is being caused by climate change, population pressure and natural variations in climate, the FAO said. Two rivers which feed the lake, the Chari and Logone, have been significantly reduced in the past 40 years, the agency said. The organization will unveil the results of a study into the diversion of the Oubangui river in an effort to help Lake Chad at a conference, "Saving Lake Chad," in Rome, Italy, on Friday. "Water transfer is not a new thing," Koohafkan told CNN. "The major problem is that this is water transfer among different countries. "These options cost money, and need policy work, need technical work," he said. "Some kind of public-private partnership would be needed" to pay for any solution as ambitious as diverting a river. The lake borders on Cameroon, Chad, Niger and Nigeria, one of Africa's most populous countries. It measured about 25,000 square kilometers (9,652 square miles) in 1963 and 1,500 square kilometers (579 square miles) in 2001 -- just under 17 percent its size 38 years earlier. Lake Chad is only one of many inland bodies of water which are drying up. Similar warnings have been issued about lakes in Mexico, Russia and elsewhere.